I have a lot of love for pancakes. When we (me, my sister, and cousins) were little my grandfather would make us pancakes and they were the absolute best. We would get so excited if Grampie was making pancakes for us, especially the pancake men! He even got up early on the morning of my high school graduation to make them for me while everyone else was still asleep. I actually think that is the last I’ve had them. Funny how we remember those little details like that in life. I’ll have to put in a request the next time I’m home. To this day I can’t tell you what secret ingredient was in there to make them extraordinary. In fact, I think he used Bisquick. Perhaps it was all the love and care that they were made with? Or maybe it was the fact that he made them for us at lunch time? I’m guessing it was the former. Needless to say it’s slightly disappointing that Brent doesn’t like pancakes. He has a food aversion to buttermilk that stems from some childhood trauma. Even regular pancakes I make without buttermilk he has a hard time enjoying. So I set out to make something a lil different, but not too crazy. Somehow this idea came to me and I ran with it. * The original recipe called for 1 cup but I found the mixture to be too thick. If you like a thick batter, use only 1 cup of milk. 1. In a large bowl combine flour, salt, baking powder, and cinnamon. Whisk mixture to incorporate. Melt butter in the microwave and add brown sugar. Stir to melt sugar. Allow to cool, then add milk, vanilla and egg and then mix together. 2. Add your wet ingredients to your dry ingredients and stir to combine. There will be some lumps, don’t worry about them. 3. Heat a nonstick griddle to medium-high heat until hot. A drop of butter or water will sizzle when it’s ready. Lightly grease your griddle with melted butter or using cooking spray. Pour a small amount (about ¼ cup) of batter unto the hot griddle. I use a measuring cup to do this. It works great! 4. 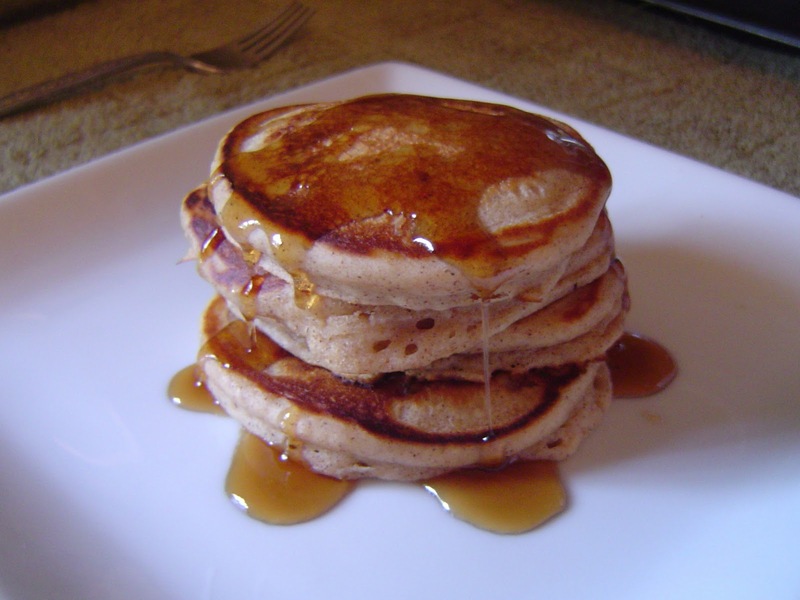 Cook pancake until golden brown on the bottom and bubbles start to form on top. About 2-3 minutes. Then flip and cook an additional minute or two until the other side is also golden brown. Continue with the rest of the batter until gone – don’t forget to re-grease your pan in between batches! 5. Serve immediately or transfer to a warm ovenproof plate in the oven until ready. Thoughts: I’ll start off with the most important part – Brent liked them! And I found them to be pretty great too. They were fluffy with the right amount of “spring” to them. The cinnamon flavor shined but wasn’t overpowering, while the vanilla played nicely in the background. I found that the brown sugar added some depth of flavor as well. Obviously it has a different kind of sweetness than white sugar does, and I thought it complimented the cinnamon beautifully. I think it worked in that secret ingredient way that makes people say “what is THAT?” in a good way. I think these would be perfect to make for a Saturday or Sunday morning breakfast this weekend! And if your pantry is anything like mine, you already have all the ingredients on had. How easy is that? Thank you for this recipe it was delicious! I tripled the recipe because I have 4 kids :) and everyone loved them. Just cooked these for my mother as her mothers-day breakfast. I did alter the recipe slightly, though. Added an extra 1/2 tbsp each butter and brown sugar, extra 1/4 tsp vanilla extract, and 3/4 cup chopped pecans to the recipe and they tasted fantastic, everyone loved them.